Having already given evidence to the Culture Select Committee of the House of Commons, David Lee, the editor of The Jackdaw was asked to justify some of his criticisms in writing. What follows is his further submission to that Committee. We were discussing, I recall, the Arts Council Collection, a repository of some 7,546 works (plus 67 more bought in the last twelve months), which has no permanent home, the overwhelming majority of the work (80% according to an ACE employee, 70% according to the Chief Executive of ACE) being at any one time in store. I stated my belief that in times of financial hardship it is imprudent that new acquisitions should be made of work by artists who are either already extensively represented in its own or in other Government collections: for your information, apart from the Arts Council’s these state-owned holdings are most conspicuously the Government Art Collection (13,500 works, plus 75 new works added this year); the British Council Collection (8,500 works, plus 100 new works bought recently); and the Tate (78,000 works, more of whose recent acquisitions below). In the last year the Arts Council has acquired a work by Jeremy Deller (who is currently a serving trustee of the Tate; a gallery which awarded him the Turner Prize in 2004). It is the third work in the collection by the artist. The Tate also already owns five major works by Deller, four of which are not on display. These include his most famous work, a film and installation of the re-enactment of a confrontation between police and demonstrators at Orgreave during the 1984 Miner’s Strike – a work funded, incidentally, by the Arts Council Lottery. The Government Art Collection has also this year bought a work from Deller; indeed it is the same work as one of the un-displayed pieces in the Tate’s collection, and also repeats the same Deller work in the Arts Council Collection The British Council owns three works by Deller, one of them being – you guessed it – the same work – “History of the World” bought this year by the Government Art Collection and which is also in the permanent collections of the Tate and the Arts Council. Is the public trying to corner the market in this work, for it owns four copies of it? History of the World is, incidentally, a moderately amusing flow diagram relating Acid House music to Brass Bands: I suppose it would be considered impertinent nitpicking to comment that it contains not the merest thread of art. There are also ten works by Deller in the Victoria and Albert Museum. Deller has recently been in the forefront of the campaign by Turner Prize artists to ensure that funding for the visual arts is maintained and, if possible, increased. His support is not surprising really, is it? Such duplications are obviously wasteful and indicate more generally that collections might rationalise their purchasing nationally, or at least regionally. How many national collections, each harbouring enormous quantities of unseen work do we need buying works – even the same ones – by the same few fashionable artists? You must bear in mind that the Arts Council and British Council collections were both inaugurated to make purchases from artists at the beginning of their careers in order to give them confidence and support and encourage them through the rough period immediately following art college. This seems an estimable use of scarce resources because established artists don’t need help from the state. Or you wouldn’t have thought they did. That laudable policy has been overturned by both the Arts Council and British Council to the extent that they are now acquiring works from a roll-call of the most recognisable and successful brands in British art… Effectively, both are duplicating the collecting responsibility of the Tate. Also this year, the Arts Council Collection bought nine works by Wolfgang Tillmans, a German photographer and also, like Deller, a Turner Prize winner and a serving trustee of the Tate Gallery. (Incidentally, why any of our British photographers don’t qualify as a trustee of our principal gallery is bewildering. Mr Chairman, your committee may at some stage decide to look into the fishy resistance of the Tate to having appointed to its Board of Trustees any but Turner Prize winners and nominees.) These nine works were acquired despite the Tate already owning 63 works by Tillmans, none of which is currently on display. The British Council also owns11works by Tillmans. Forgive my impertinence, but what is the work of a German photographer doing in the collection of a body whose founding function is to advance the standing of British Culture abroad? Another bulk acquisition this year to the Arts Council Collection was five works by Keith Coventry. The collection already has in its vaults 23 works by this artist. The Tate also owns four works, one of which is currently on display, and the Government Art Collection and the British Council own another one apiece. I notice in passing that the Arts Council Collection also acquired this year 3 works by Bridget Riley to add to the 11 existing in the collection. Riley also has 30 works in the Tate (4 currently on display), 9 in the Government Art Collection and 30 pieces in the British Council Collection. The most expensive purchase this year by the Government Art Collection was the £57,500 paid for Cornelia Parker’s 14 crushed silver-plated objects: her ninth work in the collection. There are already 21 works by Parker in the Tate’s collection (2 currently on display), one of which is from the same series as that bought by the Government Art Collection, though it is not on display. Another Parker work, also from the same series, is owned by the British Council among 6 works in that collection by the same artist. The Arts Council Collection owns a further nine works by Parker, one of which duplicates a work in the Victoria and Albert Museum’s print collection. I could continue like this indefinitely. Considerable savings could be made by stopping all but essential purchases and especially those which duplicate acquisitions in other national collections. Indeed, I can see no reason why the any of these four organisations (the Tate, ACE, GAC and the British Council) should make any purchases at all in the next few years because they already own far in excess of what they can ever exhibit. The works in the Arts Council and British Council collections which are never shown and never requested for loan should be given to regional museums, or otherwise sold. Additionally, there is no good reason why the Government Art Collection should not be disposed of in its entirety. The public would lose nothing by these disposals and receive positive benefits in terms of savings and capital gains. If ministers wish to borrow works for their offices why can’t they do it from the Tate which has an unseen cache of work five times the size of the Government Art Collection’s. Further on the subject of State acquisitions… The next time you hear Sir Nicholas Serota moaning about not having sufficient money to extend the collections of his exponentially expanding empire, please bear this in mind: in the last four years for which there are published records, 2006-2009, the Tate has acquired 2,209 new works. This equates to one new item every sixteen hours for four years. Indeed, in the last five years the Tate Gallery has absorbed more new works than the National Gallery has accumulated in its entire 186-year history – the National Gallery, incidentally, has all of its works on display. If a moratorium were placed on new purchases for, say, the next five years in all national collections, visitors to the galleries would notice no difference to their experience. 1. The overwhelming majority of British artists would not notice the complete withdrawal of all Arts Council funds allocated to the visual arts because they are considered by the Arts Council to be “the wrong kinds of artists” and don’t benefit from the Arts Council’s existence in any way at all. 2. The visual arts are unlike any other discipline dealt with by the Arts Council. In drama and music, the concert halls and theatres and the canons performed in them already existed. In the visual arts the Council opened its own galleries, some of them like the Whitechapel limping relics from a former age. These have been most often directed by the AC’s own former employees who are reliably steeped in the ethos of the Arts Council. The Council then institutionalised a new species of what it calls “Challenging Contemporary Art” to exhibit in them. Everyone else who falls outside this conveniently ill-defined phrase is excluded. The Arts Council has thus established an unhealthy monopoly, indeed a tyranny, which excludes more artists and styles than it includes. This derives solely from the personal prejudices of Arts Council employees instead of upon an intellectual openness to excellence wherever it exists on what is a very diverse stylistic spectrum in current art. 3. If you were today devising from scratch a way of funding the visual arts, you would look at the way the Arts Council does it as an object lesson in how to fail the overwhelming majority of your constituency. 4. The need to rationalise in some way national and regional art collections first occurred to me in November 2006 when Bury Council auctioned a painting by L S Lowry from Bury Art Gallery in order to plug a gap in its annual accounts of £500,000. The painting sold for £1.4 million and the surplus was apparently used to pay for a library in Ramsbottom. De-accessioning, as this process of selling works from public collections is clumsily called, is a thorny subject which always causes outbursts of possessiveness among museum people. The truth is that when Bury sold its Lowry and left its walls devoid of a work by this highly popular local artist, there were in public collections within a few miles of Bury 305 works by Lowry which were not on show; these included 13 in Whitworth Art Gallery, 19 in Manchester City Art Gallery and 270 in Salford’s Lowry Centre. Galleries in Preston, Stockport, Bolton, Burnley and Oldham also had works by Lowry in their collections which were not at the time of the Bury sale on display. It is not that there is a shortage of works in public collections by artists like Lowry but that they are unseen in places that don’t apparently currently need them. If ever there was an argument for a centralised, collectivised management of art collections it was highlighted by the sale of the Lowry from Bury Art Gallery. 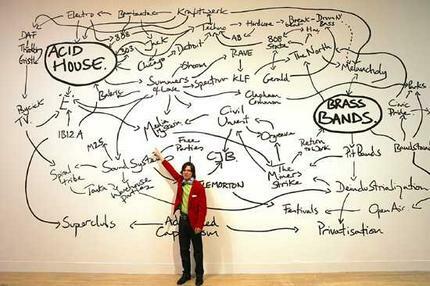 Above, Jeremy Deller in front of his Turner-prize winning installation “History of the World”, a print of which is owned by the Tate Gallery, at which institution he is presently a trustee. Above, the print of Jeremy Deller’s Turner-prize winning “History of the World” that is owned by the Tate. Above, the print of Jeremy Deller’s Turner-prize winning “History of the World” that is owned by the Government Art Collection. Above, the print of Jeremy Deller’s Turner-prize winning “History of the World” that is owned by the Arts Council Collection. Above, the print of Jeremy Deller’s Turner-prize winning “History of the World” that is owned by the British Council. 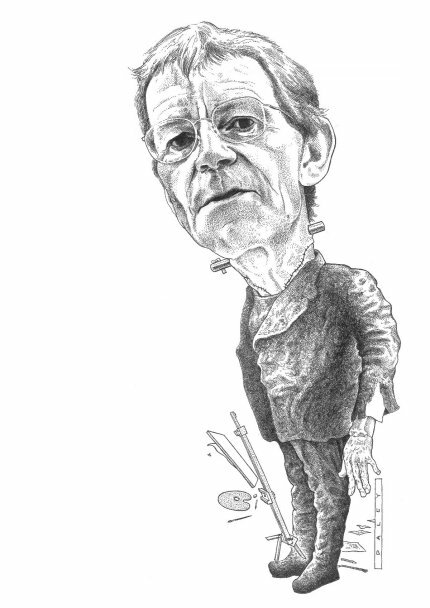 Sir Nicholas Serota, director of the Tate since 1988, as drawn by Michael Daley for the cover of Jackdaw No 5, February 2001 (“Serota Dangerous dictator?”). Click on the image for a larger version of the drawing. NOTE: zooming requires the Adobe Flash Plug-in. This entry was posted on December 18, 2010. It was filed under blog.